So, if you’re going to set up housekeeping you need some stuff. “The Goods Steps” are just a step-by-step plan to manage that process. I am sure there are many ways to do this, so feel free to adapt these suggestions! This is Step One of an eight step series. You can find the series overview (with all published posts) here. Step One is to make a list of everything you think you need (or want) for your new household. This is something a friend or relative can easily help with ~ especially if they are list-makers and you are not! Why Make a List of Everything You Need? 1. So you won’t buy things you don’t need. 3. So you get the things you need the most. 4. So you do don’t waste time while shopping or registering for gifts, just trying to figure out what you need. Get together and discuss where you are going to live, how large your home will be, how you envision your home looking and working, etc. Basically, what do you want your home to be like? 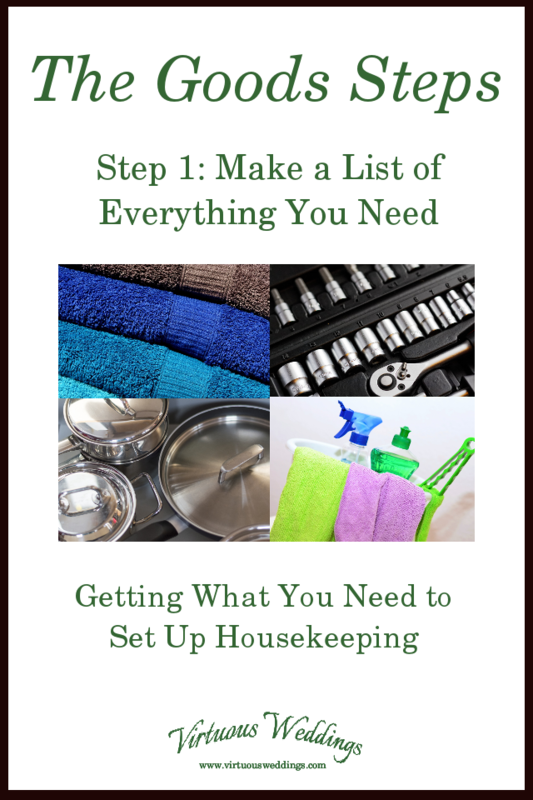 This is foundational to deciding what you need to set up housekeeping. Consider the lifestyle you want to live as well as the lifestyle you will probably, realistically, be living for the next few years. Talk about your values, especially as they relate to products and spending. This list will take a while to make, so you can’t really do it together in one sitting. I think it’s best to make lists separately and then compare them (and combine them). Include everything you need, even if you already have it. As a rule, the bride should make the lists that have to do with food, housewares, her own personal belongings, home decor, and anything else that is for what we usually think of as “homemaking” or “housekeeping.” She should also handle any more or less neutral categories that her groom doesn’t want to take. Break your list down into as many categories as you need to make it manageable. As a rule, the groom will make the list for tools, farming equipment, or other manly things, and his own personal belongings. Break your list down into as many categories as you need to make it manageable. Each can and should write down things they think of that are not in their “territory.” They should also review each other’s lists and make suggestions before the final list is made. Some categories, such as clothing, are personal and don’t need to be discussed or included on the final list. They are helpful only to the individual! Be sure to indicate quantities where applicable. You may also want to note sizes, brands, or other information (you’ll need this later, so if you know it now you may as well write it down now!). You might . . .
Brainstorm based on your experience as a housekeeper or assistant housekeeper, or your education in homemaking. What kitchen tools do you use when you cook? What linens do you regularly use ~ towels, sheets, table cloths? What tools can you think of in relation to the various tasks of homemaking? Ask your mom, your grandmothers and aunts, your sisters and sisters-in-law. Ask your future mother-in-law and your future sisters-in-law. Browse books: Home Comforts: The Art and Science of Keeping House by Cheryl Mendelson is an excellent resource, as are other books about housekeeping or home management. Browse cookbooks. What tools would you need to make things you think you’d like to make? Ask ladies in online forums or groups, or from your church, or among your parents’ friends for suggestions. Browse the web. What about: homemaking sites, organizing sites, stores? Or specialty websites dealing with home decorating, cooking, or gardening? Look at bridal or wedding registry guides at online stores. Even if you don’t plan to register there, they will give you ideas. 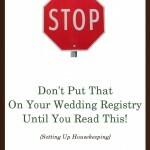 Look at registry guides at wedding planning websites. Browse stores (take a notepad with you!). Make sure your list is in logical categories so that you can combine your list with his in manageable chunks. Remember, some personal items you may not need to share. Brainstorm based on your experience or your education. What tools do you use when you build things or work on your car, for example? Ask your dad, your grandfathers and uncles, your brothers and brothers-in-law. Ask your future father-in-law and your future brothers-in-law. Ask a female relative, if appropriate ~ your mother or grandmother may have a wealth of information about gardening, for example. Browse books: The Complete Illustrated Guide to Everything Sold in Hardware Stores and Garden Centers by Steve Ettlinger might be a good place to start. Browse specialty books in any area of need ~ auto repair, vegetable gardening, farming, home repair, etc. Ask gentlemen of your acquaintance (or not), in person or online, what they would suggest. Browse the web ~ home sites, specialty sites on subjects of interest, related stores. Make sure your list is in logical categories so that you can combine your list with hers in manageable chunks. Remember, some personal items you may not need to share. Once the initial lists are made (see future posts for more information), the bride and groom should get together and compare lists. The lists should then be consolidated. I think a spreadsheet program is the best way to do this because you can easily prioritize, add, or delete items, and you can organize them in any way you want to, at any time. More details about prioritizing and paring down in a future post. Pray about your list. Also ask a few trusted people to look over your prioritized list and give you their opinions. You can edit this list any time, as needed!